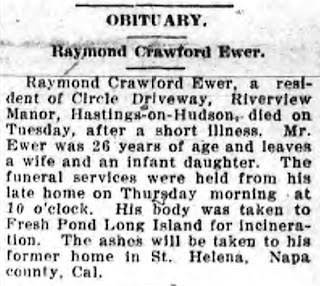 Raymond Crawford “Ray” Ewer was born in Napa County, California, in October 1888. 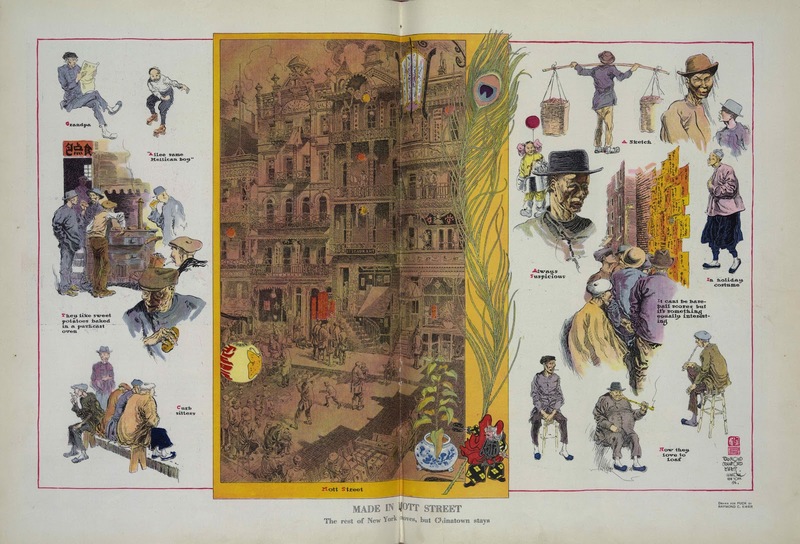 The birthplace was determined by his father’s name in the 1888 Napa County, California Voter Register. The 1900 U.S. Federal Census had the birth date information. According to the census, he was the second of three children born to Fred and Adella. His father was a “wine grower”. They lived in Hot Springs, California. In the Polk-Husted Directory Co.’s Napa City, St. Helena and Calistoga Directory, 1908, his father was the president of the St. Helena Bottling and Cold Storage Company, and they lived in St. Helena on “Kearney off Pine”. Detailed information on Ewer’s education and art training has not been found. At this time, what is known is that he attended St. Helena Grammar School. Photographs of the school and his classroom were published in St. Helena (2010). 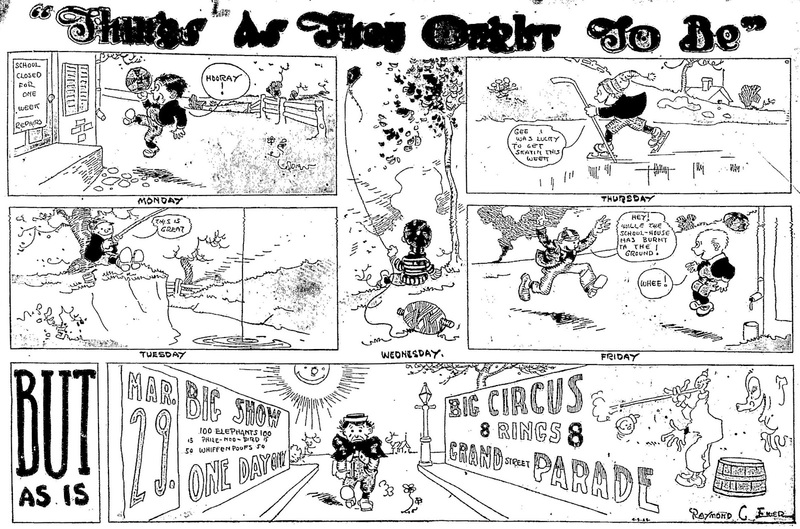 During most of 1907, he was a staff cartoonist on the San Francisco Call; his first cartoon appeared January 1 and the last on December 13. And he wrote at least one sports article, “Gallagherites Defeat the Mahonyites”. 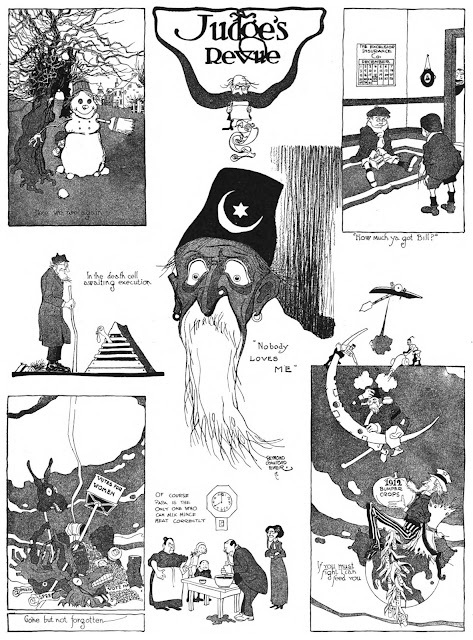 On a few occasions he contributed to the Sunday Call: February 10, “The Gentle Forefathers of the Native Son”; February 24, “Things Are Not What They Seem” featured back-to-back pages to be held up to light to see the overlapping images (here and here); and September 29, “Labor, Trade and Capital”, by O. Henry whose earlier stories in the Call were illustrated by H.C. Greening. (A list of his cartoons and illustrations in the Call follows this profile.) 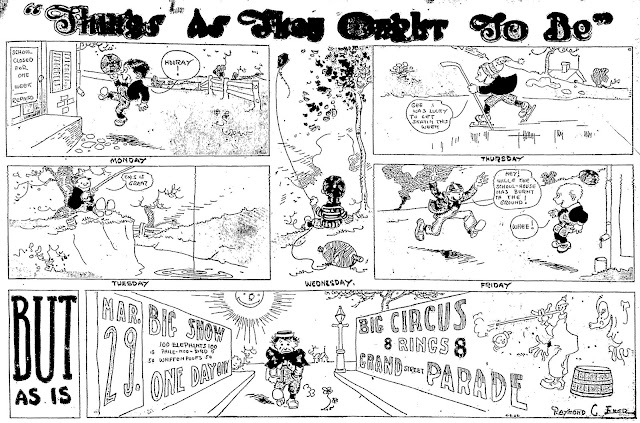 He also contributed drawings to the San Francisco-based magazine Sunset in its May 1908 issue. Dear Butch: I leave for Europe the 29 of this month, on the steamship Minneapolis. Am being sent all expenses paid by Frank Munsey. Will go to London, Scotland, Paris and Berlin, also Holland. Am going mainly to do theatre sketches, but will get a lot of misselleanous [sic] stuff to [sic]. I have been up to my neck in work since the first month I landed, for the last month have kept the income at 100 a week and some times more, but I have to hustle to do it. Have you seen the Scrap Book—it is full of my stuff. It’s not clear if he went to Europe. A passport application has not been found and his name does not appear on any passenger lists at Ancestry.com. 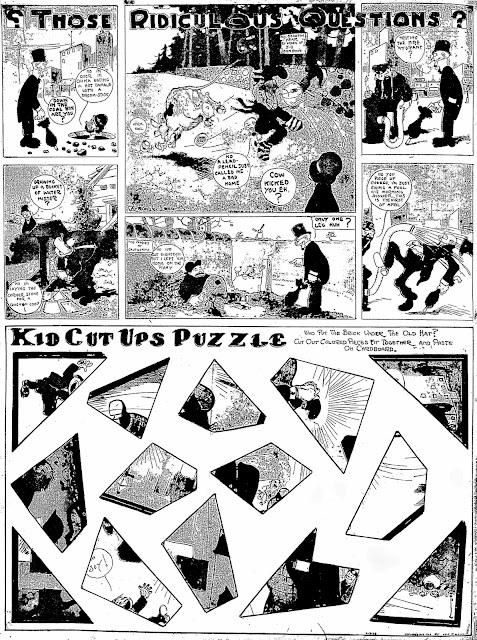 In 1909, he produced two Sunday newspaper features and kid’s activity page. Things as They Ought to Be ran from January 17 to April 18, 1909; he started Those Ridiculous Questions January 24 and stopped June 20, 1909; Kid Cut Ups Puzzle had the longest run of the trio, from January 17 to August 8, 1909. 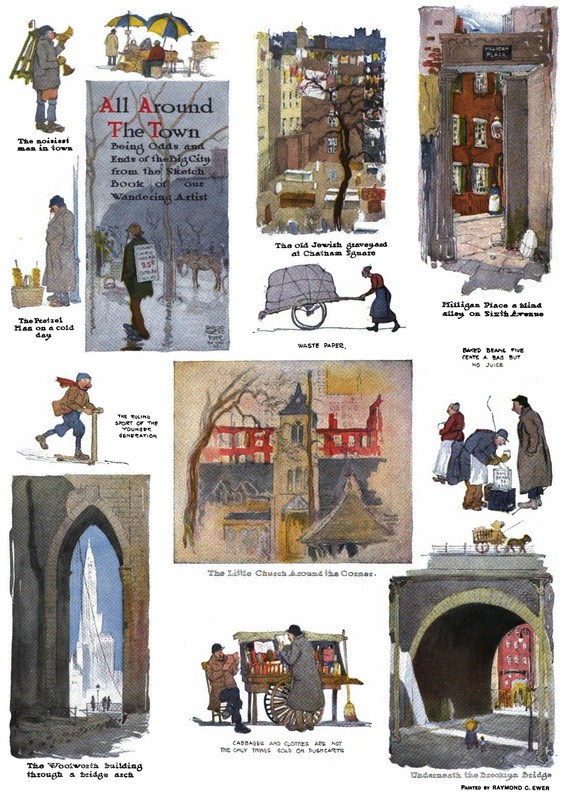 The 1910 census recorded him and his wife, Ruth, in Manhattan, New York City at 514 West 122 Street. His occupation was magazine illustrator but he continued producing comics. Brown—City Farmer, also known as Brown—Would Be Farmer, ran from May 15 to November 6, 1910. 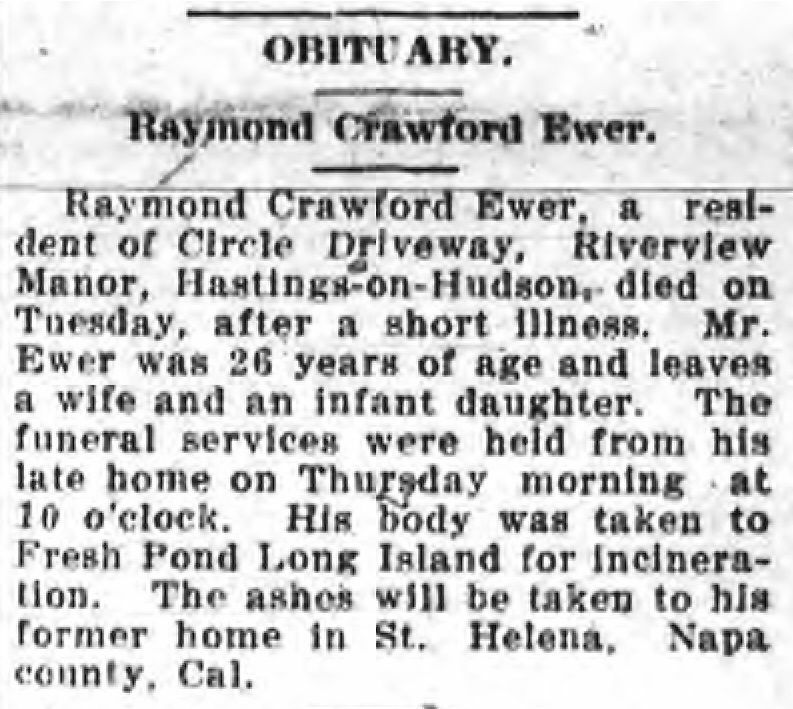 Raymond Crawford Ewer, a resident of Circle Driveway, Riverview Manor, Hastings-on-Hudson, died on Tuesday [June 22], after a short illness. Mr. Ewer was 26 years of age and leaves a wife and infant daughter. The funeral services were held from his late home on Thursday morning at 10 o’clock. His body was taken to Fresh Pond Long Island for incineration. The ashes will be taken to his former home in St. Helena, Napa county, Cal. He was buried at the St. Helena Public Cemetery. Allan and Alex-- thank you. 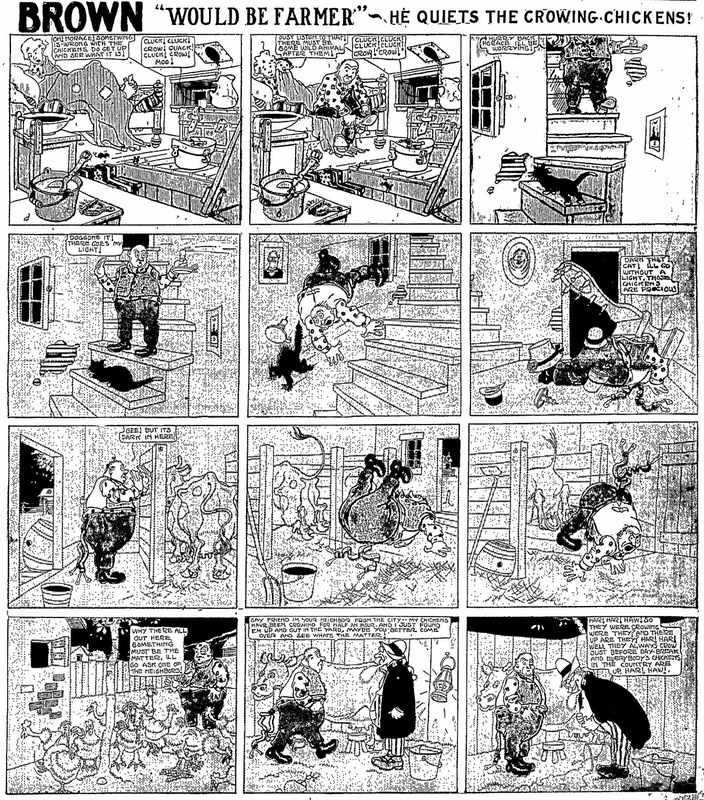 These past two days are the perfect example of why Stripper's guide is one of the best sites out in the ether. 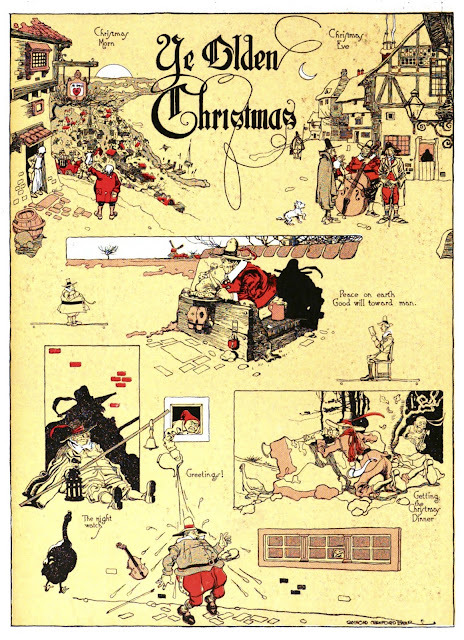 That Ye Olden Christmas page is pure magic! I can't thank you enough!! !